Dana Courtney, ACSW. Photo courtesy of the Times-News. National Association of Social Workers member Dana Courtney tries to get people to vote everywhere she goes — fish fries, festivals and even at restaurants during meals out with her husband. Thanks partly to Courtney, who has led the Alamance North Carolina NAACP voting registration drive for about a year, about 1,400 people have registered to vote. 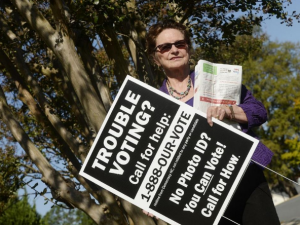 The small organization had originally planned to only register 100 new voters. Courtney, ACSW, a long-time member of the NASW North Carolina Chapter and a past chapter delegate and board member, said everyone should exercise their right to vote for whatever candidate they think will help them and society. Courtney said she is surprised by many people who have never voted and for people who are past felons who have fulfilled their obligations and are able to vote but do not. Cheers to the Times-News for telling Courtney’s story.